The letter arrived today. Although I won’t mark it return to sender, neither will I read the whole thing in one sitting. I’ll take it in small doses—the way I would with any kind of bitter medicine. I don’t need to open it to know that it isn’t a happy letter telling me I’ve been accepted into the college of my choice, or that I’ve been left a ton of money from a long lost relative. I can tell from the scrawly, once beautiful handwriting on the outside of the envelope that it’s a letter from my mother ending our relationship. “I don’t want to let the cat out, so I’m not opening the door. I’ll send you a letter. Good-bye!” My mother said abruptly behind her locked bedroom door as my boyfriend and I were leaving her house after a tension-filled visit. The only time she’s ever affectionate with me is when I first arrive at her house, or when I’m about to leave. Since I’m gifted at translating the language of my mother, I knew that the fact that I was getting a letter instead of a hug or a kiss goodbye, was a bad sign. I was in trouble as old-school correspondence is when my mother is at her most blunt and brutal. “Why do you always have to make such a big deal of it?” I asked her once regarding her written purging of old friends and relatives. She didn’t have a good reason for me, and made it seem as if letting things die quietly wasn’t in her skill set. She felt compelled to put it in writing. Since most of her friends have passed away, she doesn’t have to end as many relationships as she once did, but that has only slowed her down—not stopped her completely. I don’t understand her need to formally announce when she isn’t talking to someone. It just seems to me to be unnecessarily unkind. Why not let those relationships that she isn’t interested in pursuing any more slowly cease to be? She rarely picks up the phone anyway—she should just stop answering it all together. But for my mother, if she’s finished with you, she wants you to know about it, and I think she wants it to sting. I opened the envelope, and pulled the letter out. It was at least six pages. I glanced over it and saw words like disappointed, behavior, crappy, and finished. One of the things we fought about during our last visit was the fact that I refused to give up my life in Los Angeles, move in with her, and become her caregiver. She never gave me much thought while I was growing up, why should I have to take care of her? I considered it for a moment until she said, “I’ve always depended on strangers during my life, so why shouldn’t I in my death?” It was a weird thing for anyone to say, especially someone who does have family members to help her. If I weren’t my mother’s daughter, and we met, we wouldn’t become friends. We have very little in common—she loves nature and long walks, but hates having possessions. I enjoy all things pop culture and have a lot of stuff. Beyond that, I’m just not my mother’s type of person, and she isn’t mine. It annoys her that I’m what she describes as nice. I hate the feeling that my own mother dislikes me. No matter how hard I try to be respectful and patient, we just don’t get along. I don’t have to read the letter very carefully to know how she feels about me. When I was growing up, my mother was always self-centered, but she wasn’t mean. I fear that her version of dementia isn’t forgetting people and places, it’s forgetting how to be kind, tolerant, and loving. 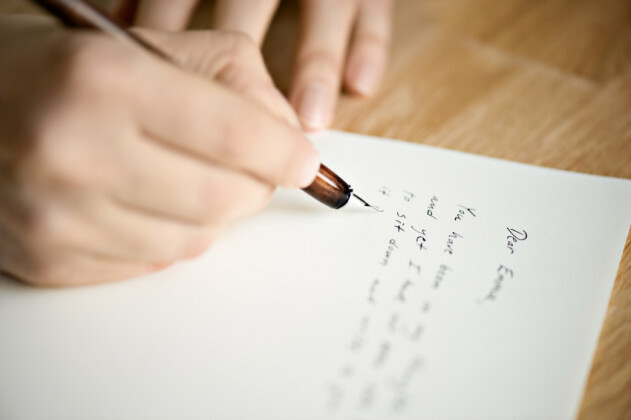 Although I’ve only skimmed the letter, I see that she’s written, “I want to discontinue our relationship.” I’m going to do what she should do when she wants to end a friendship; I’m going to ignore it and hope that she’ll simply forget about it. I’m lucky that I’m not an infant or child dependent on their mother, and that I have other women in my life to fill in when I need some maternal guidance or love. I’m putting the letter where I put all the letters I hang on to, in an old rusty MTV lunch box. Most of the contents of my letter box are love letters—this will be my first I don’t want to love you anymore letter. I doubt I will ever pull it out when I need the comfort of memories. I want to forget that I received this letter, but destroying it won’t take away the awful feeling of getting it in the first place. I probably won’t visit my mother any time soon, but I will still call her on occasion. She enjoys talking about herself, so getting her to tell me her life stories is a good way for me to avoid any negativity and still stay in touch. I’m not a masochist, it’s just that she’s my closest living relative and I’m not ready to have her gone from my life entirely. I can change our status from mother and daughter, to daughter and emotionally distant relative, and try to keep some kind of connection.